Kiama’s well-known artillery piece makes an quiet and unannounced return to outside Kiama Council. It was captured from the Japanese at Rabaul by HMAS Kiama and later presented to the town. Two flags for this ship, an early flag and the battle flag are in the Soldiers Memorial Tower at Kiama’s Christ Church. and incrediblely is currently for sale! 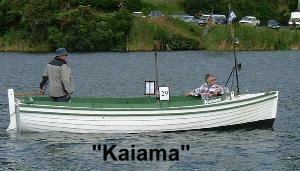 Kaiama” is an ex naval cutter fitted with an Enfield 15 hp. air-cooled horizontally opposed 2 cylinder diesel inboard motor. She first served on the Royal Australian minesweeper Kaiama in 1943 and then spent some time with the Tauranga Sea Cadets and, while with them, she was stuck under the wharf with the tide coming in and sunk. She subsequently sold at auction and extensively rebuilt. She was not used for a period of approx. 10 years and then sold to Sheryl & Malcolm Carter around 2000/01. She was again sold in 2002 to Graham & Julie Raw and is now resident on Lake Rotoiti. The Killalea State Park has been embroiled in controversy from 2007 since a private resort (Killalea Eco-Resort backed by Babcock and Brown and Mariner Financial) was proposed to take over much of the public land. Did you know that gold was found on Shellharbour beaches? Like many ex-convicts Edward Killalea survived and prospered. At Killalea Beach there was a successful gold panning business conducted for two years by Edward Killalea and Thomas Reddall(after who Reddall Parade along Lake Illawarra is named)from 1868. Mr Killalea was paid ten shillings a month by other leasees involved in the gold panning of the sand. Edward Killalea was elected as an alderman on Shellharbour council and was a director of the Shellharbour Steam Navigation Company and died an untimely death in 1872.
merely referring to it as ‘untimely’. However a more colourful version can be found here. “An autopsy was conducted on his body in the hotel with his stomach, kidneys and bladder removed and placed in jars for examination. The Fraser family bought the farm from the Killaleas in 1923 and it became known as ‘The Farm’; to local surfers after Imperial Chemical Company planned to turn it into a industrial park were shelved and it became a State Recreation Area in 1969. Most Shellharbour people would not know that Killalea Lagoon used to be known as Moles Lagoon. The area is also important to local Koori families and there is plenty of evidence of occupation at this site for many thousands of years, including the stone age midden, or garbage pit, used at Bass Point continuously over 17,000 years. Killalea Beach and State Park in 2008.
has been finished and is now on sale in the Pilot’s Cottage Museum and other sites in Kiama. came down to Kiama especially to view the final product with local Kiama historian, Fran Whalan. just after the attempted assassination of the Duke of Edinburgh in Sydney in 1868. It is known as the Kiama Ghost Speech. The re-enactment stars Ian Maurer masterfully playing Henry Parkes and was performed in the presence and with the help of, descendants of families who were present that day. The re-enactment occurred last year in August 25th in the Kiama Courthouse, 147 years after the original event. Ian Thom confessed himself well-pleased with the final result. “Its wonderful, the DVD captured the magic of the day,’ he said. Ian Thom and Valerie Thom with the Henry Parkes DVD. The Heritage Walk around Kiama is now in place. The theme of the nine signs is ‘The Role of Quarrying Basalt to the Development of Kiama’. 4. Halfway down the path in front of the Terrace Houses in Collins Street which explain that they and some of the Houses in the Pheasant Point area were built as quarryman’s houses. 5. Storm Bay which talks about the environmental features of the area prior to European settlement. and the rest are around Kiama harbour and these talk about the construction of the harbour in regard to the export of basalt. “The heritage walk based around these signs is destined to become a popular and healthy activity for visitors as well as a source of cultural identity for residents as they learn more about Kiama’s heritage,” said a Kiama council Spokesperson.